MD5Summer is an application that has been developed to generate and load MD5 checksum codes, that will help us to be able to verify the integrity and authenticity of a file in a very easy way, because since the use of the Internet spread at a global level, a series of “trash” data and files has started to appear on the network, and due to this it is necessary to verify each file. The cryptographic hash function MD5 (Message-Digest Algorithm 5) was developed by the MIT (Massachusetts Institute of Technology) as a protection system against any kind of fraud related with the distribution of files. 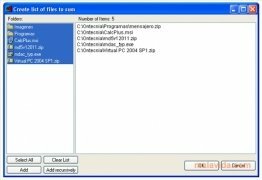 To be able to use the application, it's only necessary to select the files from which you want to generate the code and specify the output folder in which you want to save the resulting file, that can be in MD5 or TXT. The interface is very similar to that of a file explorer, thus resulting in a tool that is very easy to use, even though it's possible that due to the main use of the tool very few users will be able to make the most of it. Download MD5Summer and verify everything that you have downloaded from the Internet.